This soup works really well if you are hosting a large dinner party. You can make this soup ahead of time and let it simmer for an hour or so. It is always nice to be able to keep your meal simple and have everything prepared, leaving you with time to sit and relax with your friends. Over the course of a few years I have made this soup over and again making minor changes and this is the latest and greatest rendering. I especially enjoy fresh cilantro, lime wedges, extra minced chili peppers, cotija cheese and avocado as a garnish on the table for everyone to finish off the bowls to their liking. Cotiija is a part skim milk cheese with a delicious sharp flavor. It crumbles nicely and melts rather well in soups. It’s characteristics are much like feta so you could substitute if you like. I put out a large bowl of good quality tortilla chips to crumble on top. 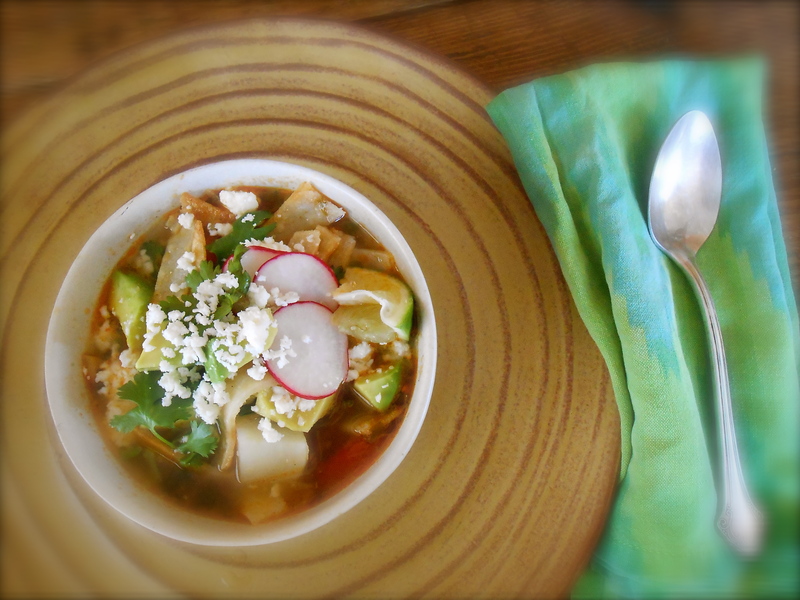 If you are feeling up to it home made tortilla chips are unforgettable and I think you should make them for this soup. 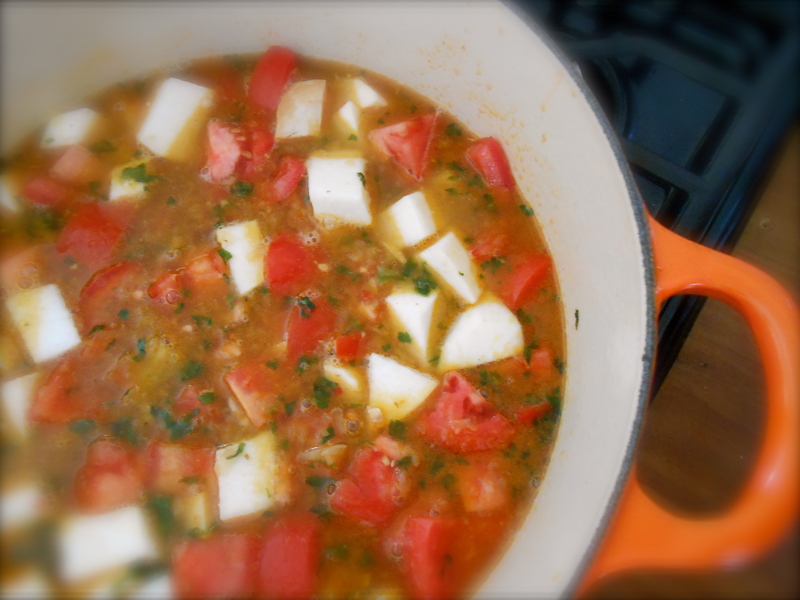 Using medium high, heat the olive oil in a large pot. Add the chicken breast, cook until browned 5-7 minutes each side. Remove to cutting surface and allow to cool. 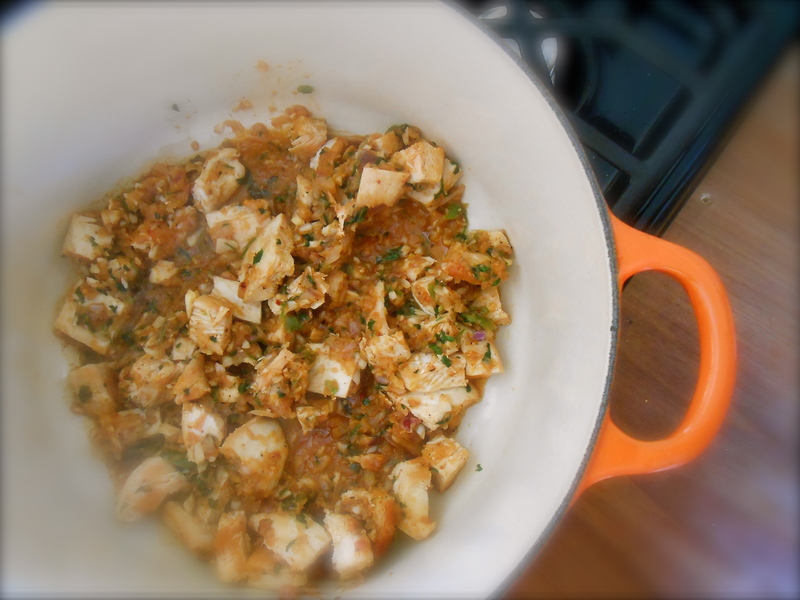 While chicken is cooking prepare onions, cilantro, garlic, turnips and tomatoes and set aside. After you have removed the chicken from the pot keep the olive oil/chicken bits concoction. Turn the heat to medium high and add onions, garlic and cilantro and cook until aromatic. Sprinkle chili powder, cumin, smoked paprika, salt and pepper combine well and allow flavors to infuse over low heat. Meanwhile, chop the chicken into small broken bits and add it to the pot and mix well. Allow to cook 5 minutes. Add the stock to the pot, then turnips and tomatoes and bring to a boil. Reduce heat and simmer for an hour. Assemble garnishes in serving bowls and take to the table. Divide the soup among serving bowls. Everyone tops their own soup. I am always on the hunt for good appetizers so thank you for posting this! Your pictures are beautiful and the soup looks divine. I’m looking forward to trying it! Totally agree about advanced preparation for guests. I don’t like cooking after they arrive. The soup recipe looks delicious- on my list to try. I hope you do try this Jovina. It is a nice spicy, hearty, yet light soup. The turnips are wonderful stewed in the spices. I know I would love you spicy chicken soup. I use the same toppings when I make pozole. Wonderful soup, love all the additions. It is perfect for entertaining. I bet it even tastes better the next day. It’s great to set out bowls of different things to garnish and let everyone tailor their soup to their taste. YUM! You are right. It is so much better the next day! Wouldn’t that be a great idea to make the dinner for your guests the day before! Then you could really relax before they show up. Or, in my case, spend a little more time cleaning up the place! lovely and earthy soup like this can save my days…. well done within the plating too my friend! Thank you so much for the compliment! Very nice. Very nice and attractive soup. Cumin and fresh cilantro always make a fiesta. For me it does not have to be cool outside for soup. I’ll eat it anytime of the year. I’ll keep an eye out for the Texas Toast chips…not sure if they are available here or not. However, chicken enchilada soup sounds amazing! Are you going to post it? Isn’t it odd that, regardless of how much I like soup, I’ve never had soup with garnish like yours before. Really must try it one of these days. Okay, to buy turnip I need to go to the superstore. Well, as I haven’t been there for a while maybe this is the excuse! And I’m loving the idea of the home-made tortilla chips! I have been preparing this soup for a few years and just recently had the idea of turnip. I used to put potatoes in, which are delicious too, however, the turnip really is lighter, less starchy, and I really like the texture better. I think you would love the fresh garnish in a soup. It really “freshens up” the flavor! I thought of you the other day as a friend gave me a very large bouquet of fresh bay leaf from her bush. I wish I could send you some! I have been using it quite a bit and am discovering some very nice flavors in doing so. Oh this sounds so yummy! I can have soup anytime of the year –even when it’s scorching hot out. Thank you so much for sharing this with us. Lovely indeed. It looks so tasty. This soup sounds heavenly! and I love the fact that you can make it ahead in large amounts! thanks so much for sharing my dear! Thanks Felicia. :) Hope you are enjoying your sis! How do I apply to be on the guest list for one of your fabulous dinner parties? :) Wouldn’t that be fun Lindy?! Maybe you can jump off that big boat you’ll be floating by in…. Oooh, I don’t believe I’ve ever had cotija cheese, but the way you describe it sounds amazing. These flavours are great—ones I’ve missed while being too far from Mexico and South America! I love soups that warm you up, all while having a freshness to it. LOVE it! Me too. This soup brings so much comfort. It is one I make all the time! Wow! This looks amazing. It has a bit of a Mexican flair with the lime and cilantro combo and of course the cotija, which I love. Have you seen my pozole? I love the addition of cumin here and of course the Spanish smoked paprika! You are currently reading spicy chicken soup at COTTAGE GROVE HOUSE.